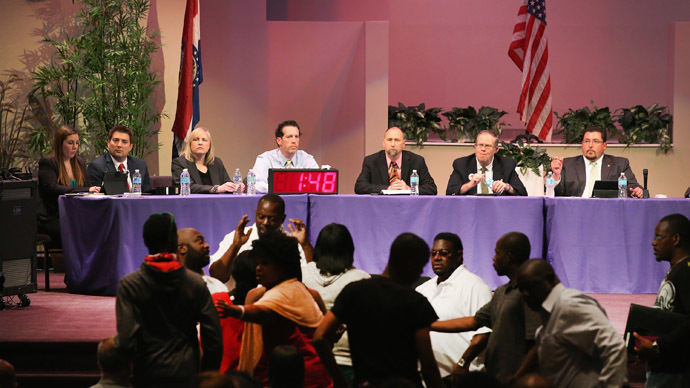 The Missouri town’s first public meeting since the shooting death of black teenager Michael Brown, 18, killed by a white police officer on August 9, turned chaotic with audience members shouting down Ferguson’s council members. Despite being held inside of a chapel, Mayor James Knowles had trouble from the start maintaining peace and order during Tuesday’s stormy meeting, which was hoped to be a venue for recommending court and police reform. Knowles opened the meeting by reciting some of the measures City Council had recommended, including the creation of a Citizen Review Board that would oversee the reform of the Ferguson Police Department, which consists of just three black police officers out of 53. This sort of disproportionate representation is also reflected in the City Council: With a population of 21,000, two-thirds of the citizens of Ferguson are African-American, while the mayor and five of the six council members are white. At the same time, a recent report by the Missouri attorney general’s office showed that black motorists were twice as likely as whites to be pulled over and arrested by Ferguson police. The council also pledged to reduce court fines, which amounted to $2.6 million last year – nearly twice as much as the courts collected two years previously. But the 600-member audience, who had to pass through police and metal detectors to enter the church, wasn’t buying it. 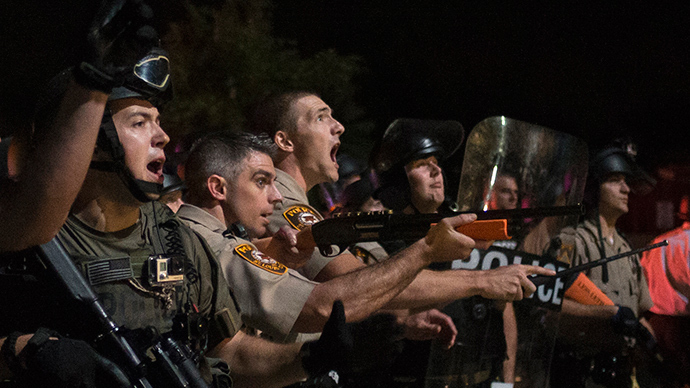 The crowd quickly descended into a cacophony of chaos, with some demanding the arrest of Darren Wilson, the officer who shot Brown following an encounter between the two men. Others expressed their deep frustration with the council. 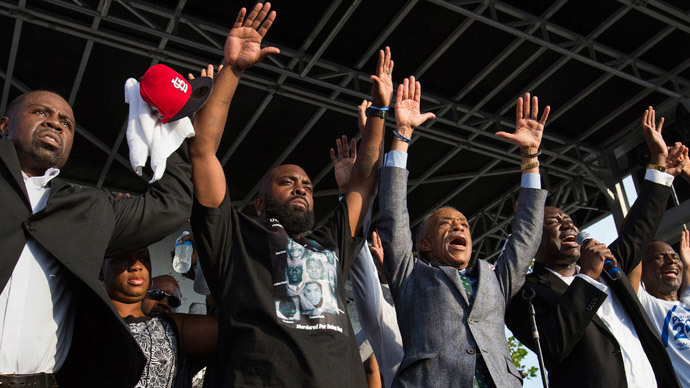 The shooting death of Michael Brown brought thousands of Ferguson residents out onto the streets in protest and violence, which continues to simmer today. 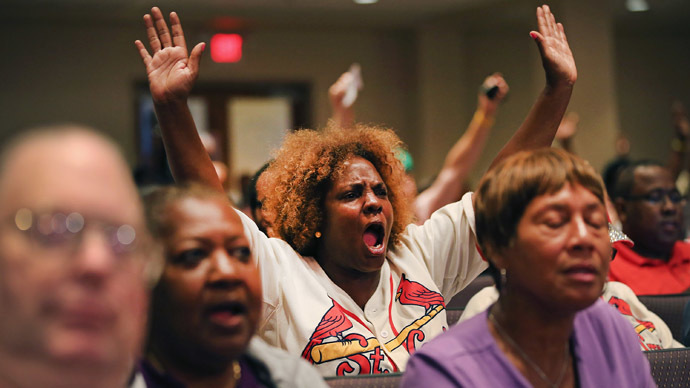 About 20 people gathered outside Ferguson police headquarters on Tuesday to call for Wilson’s immediate arrest. Other speakers called to block traffic on Interstate 70 in Ferguson on Wednesday in an act of civil disobedience, AP reported. Organizers say they want to bring rush-hour traffic to a standstill. 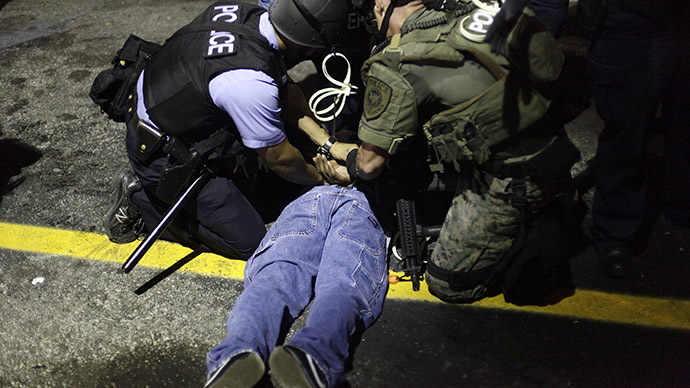 The US Justice Department announced last week that it was opening an investigation into the Ferguson Police Department, following accusations by Ferguson residents that the police practice racial profiling and other discriminatory measures. A local grand jury is investigating the killing of Michael Brown in an effort to determine if officer Darren Wilson acted in self-defense.